I am in the process of planning a very exciting concert I will be giving at Handel House in November, as part of a concert series called 'Seeing Music'. My bit is going to be about the changing image of opera throughout history. It's a topical subject at the moment as opera singers far and wide have risen up in defence of a young soprano following "a slew of body image insults hurled at her by british critics". Now, I think the term 'slew' is a bit of an exaggeration; they said that she's a very talented singer but that she was miscast, she looked dumpy and the costumes didn't do anything for her. "But it's all about the voice!" Opera singers insisted. "Since when has opera been about appearances?" Since always. Otherwise opera wouldn't be staged, we wouldn't go to see it, we'd close our eyes while the singers stood there and just sang it. The production in question began with the other soprano showering naked, so if they really didn't want anyone to be looking, maybe they should have sent a different message. "Her appearance ordinarily was unattractive, even ugly; but when she sang, she was transfigured. She became beautiful, inspired! She was able to thrill even the audiences of the Opera, that public of dilettanti so difficult to please or move!" She then described an occasion on which Liszt almost refused to accompany Krauss because he thought she was ugly and he didn't like her vibrato, but as soon as she began to sing he was completely won over and begged her forgiveness in front of the whole audience. Of course, I'm only mentioning women here, and that's the point that has been raised in this recent 'scandal': that it's a sign of the times we live in that women have such pressure on them to be beautiful and skinny. But that's not a new thing, either, and there's always been double the pressure on stage performers. When Nellie Melba wrote her Melba Method, one of her first pieces of advice was to get a personal trainer and not eat rich foods, because, she said, "a singer does not want to get stout." "Singers and teachers know that being underweight is far more damaging to a singer's wellbeing and performance than being overweight. Similarly I can tell you that if our stomachs are toned anywhere near a six-pack our sound will suffer. The relaxation needed for low breathing is not aided in any sense by an over worked out body. I know from my own journey that I began to sing with far more physical authority when I got beyond a certain physical weight. Below that I just wasn't a strong enough vehicle to launch sound from freely into large theatres and concert halls." That advice is far more damaging to a young singer than any amount of negative comments on appearance. She then goes on to compare singers to olympic athletes, and that's where we agree. Singers do need to train like athletes; you do need a six-pack to support your breathing; to get through an opera you need the stamina of a marathon runner. There is no excuse for laziness in singers. And a singer needs to take care of their appearance - that means knowing how to present themselves on stage so that they can be credible in any rôle. Pop singers see their weight analysed in the tabloids every day, and they work as hard on their image as they do their sound. It's an important lesson that opera singers could do with learning, as these days all the advertising around an opera is about the production, not the performers. But it's still a singers job to be as convincing as they can be within that production. Take a look at Lawrence Brownlee — no-one's laughing at him for being usually the smallest member of any cast because he holds himself so well. Whether they like it or not, opera singers are going to have to accept that opera is a visual medium, and they need to learn how to use it to their best advantage. And don't forget — I'm at Handel House on the 23rd November in 'The Fat Lady Has Sung'. See you there! 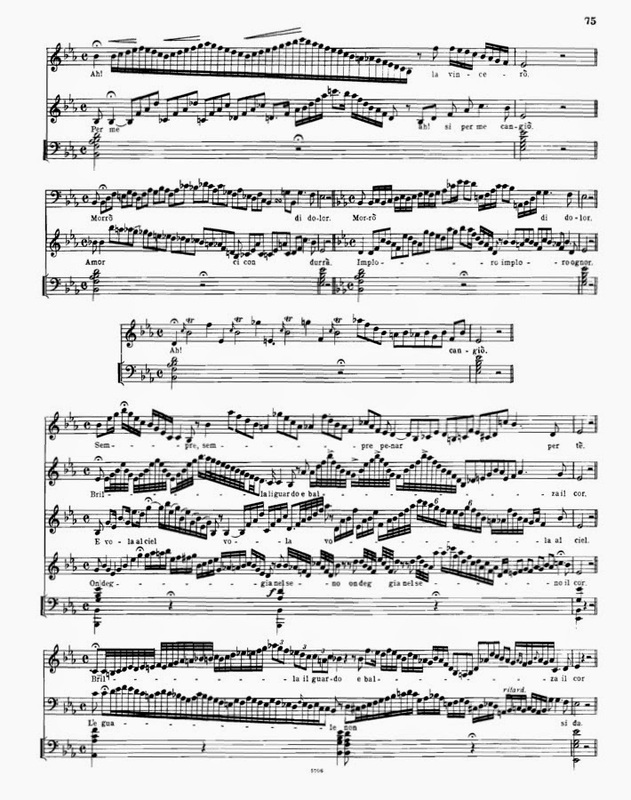 Here are some examples of cadenzas by Manuel Garcia II (or 'The Sequel', as I like to think of him). The reason I'm presenting them here is that I'm continuing my thoughts from my last post ("...it's what he would have wanted"), which were on creativity and whether a singer can be a composer in their own right. Well, they used to be. In the 18th century, — the golden age of bel canto — singers were trained in harmony and counterpoint exactly as composers were; they had to be able to understand and analyse the music they were singing so that they could improvise over the top of it. So in those days a singer was judged as much on their taste in improvisation and variation as they were on tone, execution, intonation and everything else that we judge a singer on. And the final test in taste came at the end of a song, when the accompaniment would pause and you would be required to improvise a cadenza showing off everything that you could do, all in one breath! By the 19th century, though they were still showing off, singers tended to write their cadenzas beforehand and learn them off by heart. But they would still write their own, so it would be a unique part of the performance, the singer's own cadenza. If they weren't creative, their teacher or accompanist would write it for them. These days, everyone seems to borrow each other's instead of writing their own. There are some variations on songs which have become standard, which I think is a real shame. This doesn't just apply to singers; instrumentalists do this, too, because 'classical musicians' have become so scared of improvisation. Any jazz musician will tell you it's not scary — there are rules for learning it; you don't just make up random notes and hope they form themselves into a tune. You have to understand the chords and the key you are playing in, just as those old singers used to do. And — look! Here's a handy guide by Garcia, showing you how to build on a simple tune until you have the confidence to turn it into something awesome! Don't you think it would be fun to encourage singers to be creative again? A new singer singing any old song makes it seem fresh. I think it's a shame that in the 19th century Manuel Garcia the Sequel said, "In the eighteenth century, the singer modulated according to his fancy; now this liberty is only accorded to artists who unite knowledge with perfect taste." Then he gave an example by his sister. 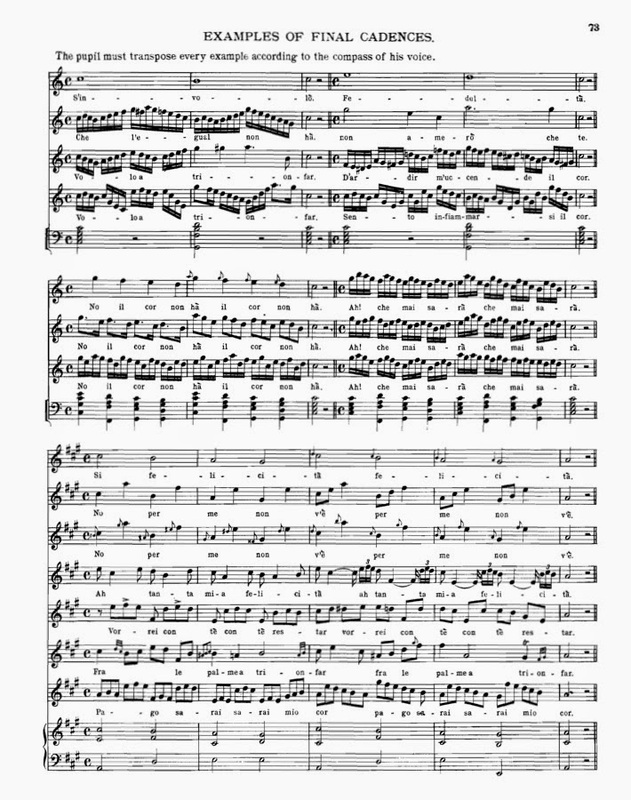 I prefer an example by one of his students, Jenny Lind, who apparently had quite a unique taste when it came to writing a cadenza, but I like how literal she was in interpreting the words. She wrote a cadenza on the word 'tears', and her descending staccato chromatic scale really sounds like tears falling. But of course — the words! You don't even have to change the notes to be creative with a song. But that will have to be the subject of another post. With my head clear of migraines now it has space for thinking again. And it has been thinking about a point that came up whilst I was being interviewed for the documentary on Resonance FM (which you can listen to again if you missed it — just click here! ). I was asked to provide some recordings of 19th century singers singing 19th century music. The examples I chose to give were of singers singing songs that they had been taught by the composers. The composers were Verdi and Gounod, and the singers were Nellie Melba and Emma Eames. I find it really exciting that we've got recordings of singers who had been chosen by the composers themselves as their favourite voice for a particular rôle and then taught how to sing it exactly. When you hear Melba sing Verdi rôles, you notice that she sings everything marked in the score: every accent; every expression. Verdi taught her his operas, so we can be sure that he wanted everything he wrote to be taken notice of, but no one sings them quite like that these days. But does it matter? Even singing modern songs, with the composer in the room, do we have to bother singing exactly what they ask us to? Maybe the singers can be the creators of a song as much as the composers are. When I was at conservatoire, I discovered some recordings by Adelina Patti of some songs by Mozart. She was in her sixties when she recorded them in 1903 and she learnt them when she was young from somebody who had learnt them from somebody who had learnt them from Mozart! (I do hope I have all the facts straight there!) The important thing is that she claimed that she sang them as Mozart wanted them to be sung. I was so excited; I thought this was the holy grail of historical performance —which is what I was studying at college; the whole point was to try to play music as it would have been played in the past. So, I learnt 'Voi, Che Sapete' from The Marriage of Figaro exactly as Patti sang it, and I took it to my singing lesson and sang it. And at the end, my singing teacher said, "No. You can't sing it like that these days." For her that was the end of the discussion. It sounds so different to how Mozart is sung these days that she felt it was just too alien for modern audiences to be able to cope with, and maybe she was right. Maybe we don't need to bother with attempting to sing Mozart's songs as he wanted them to be sung. But I remember, when I was taking part in a Mozart piano sonata competition, the adjudicator told me that Mozart was really poor, and ink cost money, so he didn't waste it. Therefore, every mark he made on the paper was important, and you have to play every one of those marks. Patti does; he writes portamento (the slides between notes) all over that song and she sings every one of them. Nobody sings any of them now. Now, I could sing a whole concert of Mozart and Verdi as the composers wanted their songs to be sung, but would it only be interesting as a museum piece? What do you think? Do you think the tradition should be continued, or should music be allowed to evolve naturally? Should we say to composers, "Once you've written the notes, it's in my hands, and it's as much my song as it is yours"? I've not made a blog in a while because I've been ill with migraines. I tried to carry on working but it was a strain on my voice when I tried to sing. This led me to thinking about health for singers and looking after the voice, and most of my research into this area depressed my spirits further! I read about the two great Marias— Malibran and Callas — who liked a party too much, and the great smokers, like Caruso, who ruined their lungs; also very talented singers I've never heard of before, because they had to give up their careers as they couldn't cure their excessive catarrh: a problem I identify with more than the other two! "Any physical reason is sufficient to make singing difficult, or even impossible; it need not be connected necessarily with the vocal organs; in fact, I believe it very rarely is." "If you wish to sing only when you are in good form, you must excuse yourself ninety-nine times out of a hundred." And she gives examples of performances she gave despite indisposition of some sort or other. Don't talk in the open air in Winter." It doesn't sound like a lot of fun, because he then goes on to say that you also mustn't party too hard or engage in many other activities which most people consider very fun if you want to have a great career like Lilli Lehmann's! Sorry I haven't posted a new blog here in a few weeks — I did, however, make a few new video blogs, which wouldn't really have worked as written examples. Part 2 of the 'Style vs Technique' debate. And finally, some exciting news! I didn't make a blog at all last week because as I was sitting down to record it, I received an invitation to instead record some examples for a radio program touching on the difference between Bel Canto and modern methods. You can hear a sample of my interview and my singing on Resonance FM on Tuesday evening at 9:30! Don't forget to tune in! I've been reading a very interesting book, We Sang Better (Vol. 1) by James Anderson. 250 tips on how to sing from singers 1800 to 1960. Singer's Tip No.134 is basically 'don't hum'. The book says that, at some time, some singers were trying to use humming to find their head voice, but that 'it in no way assists the student to get the throat free and open'. I disagree. In my singing lessons we always started by humming to warm up. When I first tried to hum, I used to keep my mouth closed and hum on 'mmmmmm', but Rae told me that the correct way to hum was to keep the mouth open and lift the back of the tongue to make the 'ng' sound in tongue. I'm also a trumpeter, and I use a practice mute, which is something you shove in the bell of the trumpet to make it quieter, so that you don't disturb anyone when you're warming up. It has another use, which is that shoving something in the bell creates more pressure, so that you have to push more air through the trumpet. To do that you have to open up the mouth and throat more. When you take the mute out, then you find that you play louder, and have a more open, full sound. It's particularly useful if you tend to hold back while playing. Humming does the same thing, because, believe it or not, singing and trumpet playing are basically the same thing, except that in trumpet, the instrument is outside the body, and in singing, the instrument is in the throat. Humming is really good to get the voice going if you've got a cold or your voice is a bit sulky, because on those days you don't really want to push it to get it started, but humming can really get the cords working without stringing, and once you open your mouth, the sound is more free and the throat has opened up. But they say you shouldn't use a practice mute too much, because it can have bad effects on your playing. Maybe that's where the singers who were trying to use humming to find their head voice were going wrong; maybe they were using it too much and producing a nasal sound. I only hum to warm up. It's important, in every aspect of practice, to remember that moderation is key. Well, with Marchesi, it's all about technique, technique, technique. "People frequently speak of the Italian, French or German School or Style of singing. Having resided for many years in the different centres of these three nationalities, I can safely say that, with the exception of national songs of a popular and local character, peculiar to each nation, there are only two Vocal Schools in the whole world: the good, ... and the bad." So how does one develop this good technique? Well, the really useful thing about this book, that makes it the perfect starting place for a singer, is that the exercises are progressive. They start off really easy, gradually getting harder and harder until you have this rock-solid technique. They start as easily as singing one note at a time, rising slowly up through the voice's range, to develop the tone. This exercise Marchesi calls 'Emission of the Voice'. "Open the mouth naturally, keep it quite still, and draw in breath slowly; then attack the sounds neatly on the broad Italian vowel A (ah), by a resolute articulation or stroke of the glottis (coup de glotte) avoiding all jerkiness as well as effort." Even learning scales starts off by singing only two notes together. "The voice in its natural state is as a rule rough, uneven, heavy, and of limited compass. Having secured accuracy of intonation in the attack of each sound (by the stroke of the glottis) the next task should be the development of volume, power, and compass of the voice, and the blending of the registers. The pupil should not at first attempt to sing the complete scale, ... otherwise there is a risk of never succeeding in any kind of passage." Eventually she expects the student to sing two octave scales in various rhythms. This graded system is used on every technique in the book, making every aspect of singing attainable with time and dedication. I think one of the most important things she writes is that, at that time (the end of the 19th century), the style of music was changing and singers weren't expected to sing really fast, flashy numbers any more to show off their vocal acrobatics; instead it was all about very long phrases and nice tunes. So singers started to say that they didn't need to learn to sing really fast notes any more, because it would just tire the voice out, and why bother? But Marchesi said that the case was exactly reversed: if you learn to sing all the fast notes and fast phrases, then you can sing the long phrases without ever tiring your voice, because it strengthens the muscles in the throat. Whereas if you try to sing the long phrases without ever having learnt the fast ones, you'll tire the voice out really quickly. Sadly, few people listened to this advice, and singers have now forgotten how to make the voice strong and flexible enough to sing fast accurately. "Every art consists of a technical-mechanical part and an aesthetical part. A singer who cannot overcome the difficulties of the first past can never attain perfection in the second, not even a genius." They said it couldn't be done. They said it shouldn't be done. But I have done it. I have raised Bel Canto from the dead, and it is my mission to share it with the world; to find new audiences for this way of singing from all those who 'don't usually like opera', and to make it a living and exciting art form again. And while I do, I will regularly document my progress right here, so come back every week for more revelations, follow this blog, and join the revolution!